An exciting tribute to George Harrison, featuring live music, film clips, narration, and a rarely seen interview of Harrison in his later years. The author of an acclaimed biography of George Harrison, Joshua M. Greene, will be joined by renowned singer and guitarist, Godfrey Townsend, to trace Harrison’s rise from the streets of postwar Liverpool to the summit of pop stardom, his discovery of spirituality in the ragas of Ravi Shankar and his efforts to bring the other Beatles along on his journey to self-realization. 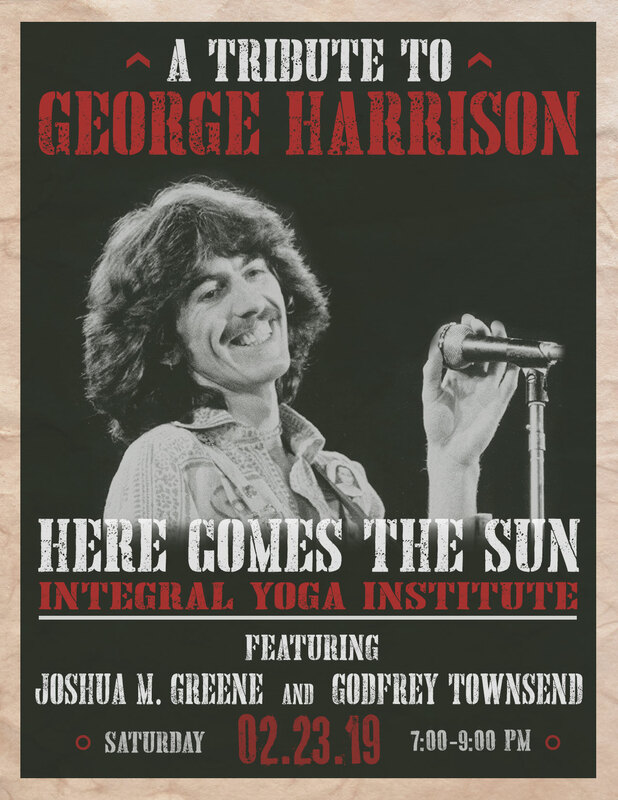 Professor Greene will also examine the role that yoga and chanting played in Harrison’s post-Beatles musical compositions, while Townsend provides performances of the songs to illustrate that influence. Don’t miss this fascinating evening that celebrates the most spiritual of the Beatles and offers a unique lens through which to view his crucial but rarely examined role in the phenomenal rise of yoga culture in the West.